Boasting a fantastic setting within a hillside residential area and overlooking the sea at Calheta on Madeira's southwest coast is contemporary Villa Jasminum. 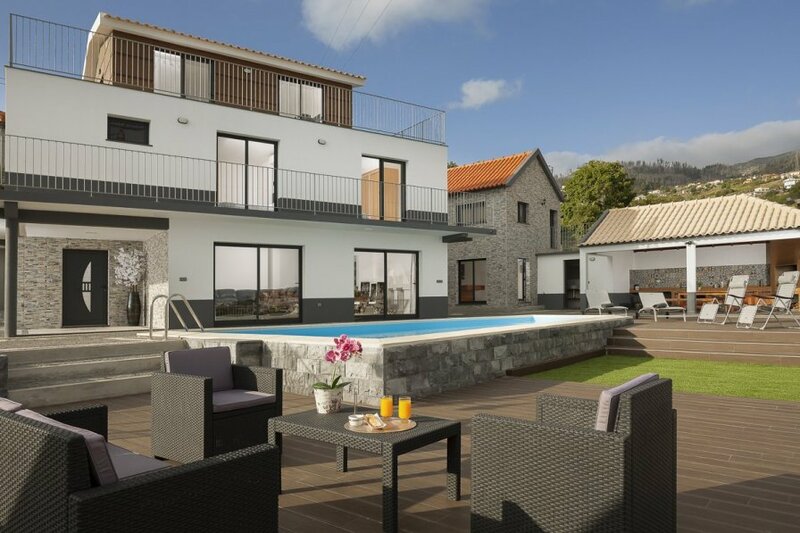 Boasting a fantastic setting within a hillside residential area and overlooking the sea at Calheta on Madeira's southwest coast is contemporary Villa Jasminum. This holiday home has been transformed from an old farmhouse cottage into a luxurious place to enjoy family time. A chic, minimalist style runs throughout the villa, with beautiful attention to detail in every room. The quality furnishings and facilities make Villa Jasminum a comfortable holiday base that fully caters to your needs. There's also plenty of outside space to enjoy, with several different areas in which to soak up the wonderful sea and countryside views. On the ground floor is where you'll find the great living/dining space, which is open-plan and features patio doors that open directly onto the outside space. The lounge area has a comfortable corner sofa and a television for enjoying some relaxed downtime. By more patio doors is the dining table that seats up to six people. The modern kitchen makes mealtimes quick and easy, with a range of amenities on offer. It's a very stylish space and features a central island for treating yourself to a relaxed breakfast before enjoying days out. Upstairs are four lovely, air-conditioned bedrooms. Two feature a king-sized bed, television and ensuite shower room each, as well as sharing access to a balcony. The other two bedrooms have two single beds and a television each. Serving these two bedrooms is a spacious and well-appointed family bathroom. A particularly impressive feature of the villa is the rooftop fitness room which is surrounded by a terrace that offers some truly breathtaking sea views. Inside the fitness room is a range of exercise equipment, including weights, a treadmill and a cross trainer. The fifth bedroom with king-size bed, television and ensuite shower room can be found on the first floor of the annexe. On the ground floor of the annexe is a large games room with billiards table, television and a selection of table games. Outside next to the annexe is a large, covered barbecue area with a built-in barbecue and dining table. The main feature is the large, private swimming pool. A selection of sun loungers and some outdoor seating provide the perfect spots to soak up the laidback atmosphere. Also within the walled outside space are charming areas of garden, giving you your own slice of Madeira countryside. Villa Jasminum is modern and luxurious 5-bedroom villa in Calheta, Madeira. The villa has a private swimming pool and summer kitchen, making it ideal for a family or friends who want to make the most of the Madeiran weather. Just a short walk or drive away from the villa are several cafes, restaurants and bars. An even greater choice can be found down by the waterfront, which is less than 10 minutes away from the villa by car. This area is where most of the town's lively activity happens. Dolphin and whale-watching boats regularly leave from the marina, giving you the chance to spot a variety of beautiful marine life. By the marina is one of the few sandy beaches that can be found in Madeira. Generally, the beaches on the island are volcanic and feature black sand or pebbles. Calheta was the first place to have an artificial beach when sand was brought in from Morocco. It's a nice place to enjoy a few hours by the sea, with the water here being mostly calm and safe for swimming. It's also perfect for a range of watersports, such as windsurfing, waterskiing, scuba diving and canoeing. You can hire sun loungers to simply lie back and let the sounds of the sea wash over you. Also down by the coast is Casa das Mundas, a clifftop museum that's full of fantastic contemporary art. Another place to tick off your list when enjoying a day out in the town is Engenho da Calheta. Take a tour around this working sugar cane factory to find out how Madeira rum is made. It's a 40-minute drive to Madeira's capital city, Funchal. There's plenty to see and do here, including several botanical gardens and a cable car that takes you right up a mountain for spectacular sea views. Also be sure to visit the old town area for a dose of history.